As the world waits for the Chinese military to provide some sort of explaination for the Ufo that closed Xiaoshan Airport in Hangzhou many further photos and videos are coming in of the large bright Ufo seen over the airport . As usual we expect some flip flop story to be spun by the military within a week but we will keep you posted as this story develops. As this was a mass sighting numerous videos and photos are slowly making it out of China into the media. Its seems that the ever increasing trend of Ufo sightings near airports may be building up to something, if you recall the last major airport incident happening back at Ohare airport in 2006. (apparent) New footage of UFO that closed Airport in China, taken from inside the plane that was diverted from the area. 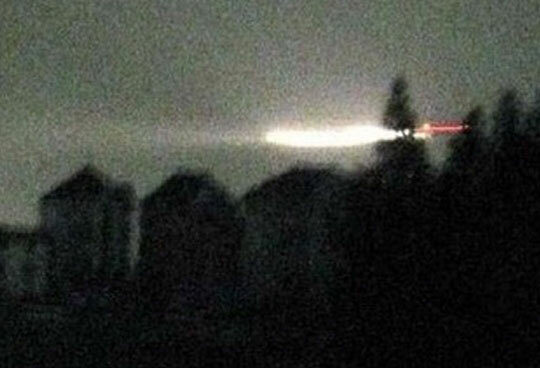 This is one of the UFO's that caused the closure of a busy airport in China last week. The authorities are still baffled and have not come up with an answer as to what this might be. The Government of China has gone completely silent over th incident. The Passenger that filmed this footage from his window seat on the plane wants to remain anonymous in fear of retribution from the Chinese Government. "In the past two weeks, China has had two major UFO sightings. The first, on July 7, was basically a glowing streak in the sky near Xiaoshan airport in Hangzhou, a city outside Shanghai. In the interests of passenger safety, airport authorities shut down operations for an hour, and eighteen planes were delayed. This photograph is undoubtedly fake. It is probably a timelapse photograph of a terrestrial aircraft of some sort that has been cut out and 'photoshopped' into the background image.... notice the double imaging on the rest of the photograph (probably caused by a double glazed glass window between the camera and the subject).. well this is not apparent in the object itself. Also the leading edge of the object appears IN FRONT of the power/telephone lines in the foreground of the picture. An obvious fake. do u actually think they would shut down airport at the cost of hundreds of thousands of dollars over a shaky picture? and all the military officials are just a bunch of story tellers and lier's. Well lets see, flown all some over the world in state-of-the-art fighters and some even went to the moon,for decade,so at the end of there career turn there life up side down,for the hell of it? Anonymous is correct. The object was spotted by pilots, airline passengers and air traffic controllers. Then, according to regulations, the airport closed for about one hour. It affected over 1,000 passengers and grounded 6 flights and rerouted 12. All this is from news reports from China. This is a serious and important event. But, there is so much disinformation about this single event. There's even articles even citing James Oberg, a foremost UFO debunker (no, he's not even a skeptic), claiming its probably Venus!